This pavilion by Italian firm stARTT has won the first international edition of the MoMA/P.S.1 Young Architects Program and will be installed outside the Zaha Hadid-designed MAXXI museum in Rome this June. See this year's New York installation in yesterday's story. As inaugural winners of the YAP_MAXXI award stARTT's installation, entitled Whatami, will feature a series of mini hills around the concrete plaza with pools of water in between. The artificial landscape will be littered with clusters of funnel-shaped canopies representing flowers. NEW YORK, February 16, 2011—The Museum of Modern Art, MoMA PS1, and the National Museum of XXI Century Arts of Rome announce Interboro Partners of Brooklyn, NY, as the winner of the 12th annual Young Architects Program in New York, and start, of Rome, as the winner of the first annual YAP_MAXXI Young Architects Program in Rome. Now in its 12th edition, the Young Architects Program at MoMA and MoMA PS1 has been committed to offering emerging architectural talent the opportunity to design and present innovative projects, challenging each year’s winners to develop highly innovative designs for a temporary, outdoor installation at MoMA PS1 that provides shade, seating, and water. The architects must also work within guidelines that address environmental issues, including sustainability and recycling. For the first time, MoMA and MoMA PS1 are partnering with another institution, MAXXI in Rome, to create the first international edition of the Young Architects Program. 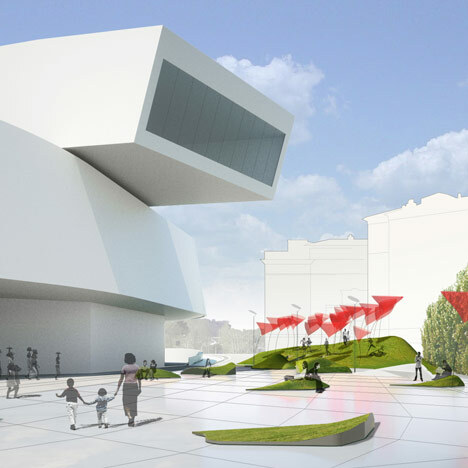 stARTT has been chosen from among five European finalists to create an innovative event space in the MAXXI piazza opening in June. WHATAMI by stARTT is based on the manufacturing of an artificial archipelago-hill, generating smaller green areas in the garden and potentially outside the museum. The hill works as a garden, injecting “green” into the concrete plateau of the museum’s outdoor space, allowing it to serve as a stage and/or parterre for concerts and other events, or as a space to rest and look at the museum itself. The artificial landscape will be punctuated by large “flowers” providing light, shadow, water, and sound. The materials proposed for the installation involve a two-fold recycling process, the supplying of the materials for the construction (straw, geo-textile, plastic) and the dismantling of the “hill” (turf, lighting). Opened in May 2010, MAXXI was designed by Zaha Hadid and awarded Royal Institute of British Architect’s (RIBA) Stirling Prize for architecture, and has already gained a place among the elite international contemporary art and architecture museums. The other YAP_MAXXI finalists were Raffaella De Simone/Valentina Mandalari (Palermo); Ghigos Ideas (Lissone/Mi, Davide Crippa, Barbara Di Prete and Francesco Tosi); Asif Khan (London, United Kingdom); and Langarita Navarro Arquitectos (Madrid, Spain, María Langarita and Víctor Navarro). Pippo Ciorra, Senior Curator of Architecture at MAXXI, explains, “We’re very happy with the results of this program for three main reasons. First, the collaboration with MoMA proved as effective and productive as we hoped, finally allowing us a surprising insight into the most recent research in terms of architecture, public space, and landscape. MOS at P.S.1 Mexican Pavilion for Shanghai Expo 2010 by Slot.